Dungeons & Dragons decided not to do another Monster Manual. They did something that’s so much more. Volo’s Guide to Monsters takes the classic D&D monster book and looks at it through a different lens, and Dungeon Masters will love it. The idea behind the book’s presentation is this: Brave adventurer Volothamp Geddarm offers his extensive knowledge on monsters and their habitats based on his in-depth research, and the wisened Elmister, archmage of Shadowdale, also pops in to offer opinions even some counter to Volo. What you get in this Dungeons & Dragons 5th edition sourcebook is lore on nine different major groups of monsters, details for seven monster races and — the meat of the book — stats, art and descriptions for more than 120 monsters and NPCs. 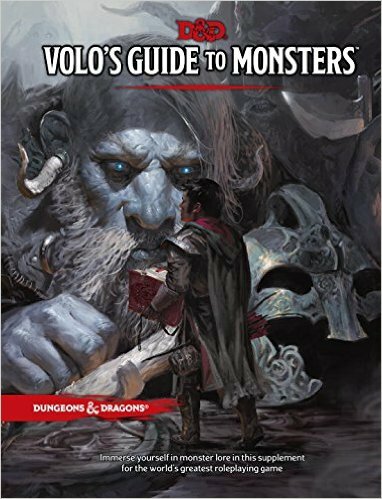 Support Crit For Brains by buying a copy of Volo’s Guide to Monsters from Amazon. Volo’s Guide to Monsters is a fantastic book. I can’t recommend it for everyone. It really is incredible. The thought that went into every page is impressive, and it is a nuanced book full of tons of fantastical detail. And the artwork is so, so good. It’s an essential tool for DMs crafting their own campaigns. Though it has some content for players, it’s definitely a Dungeon Master-focused book. Unless you’re just dying to play as a cat person or just love to read D&D lore, players probably don’t need to pick up Volo’s Guide. Especially with the price tag, I’d just borrow your DM’s copy when rolling up your character. And not even every DM is going to need it. If you’re running published adventures or don’t feel like you need more monsters, you can probably skip the book. Volo’s Guide is more for DMs crafting their own campaign worlds, those that want to expand the amount of monsters they can toss at adventuring parties or those adapting old adventures to 5th edition. Evaluated through that lens, it’s not a must-have. But I have to say that everything in the book is so freaking good. Even if I don’t use it, I’m glad I have it, especially for the book’s first section. Want to whip up a Beholder lair? The book gives you a map. It gives you tables full of names and physical characteristics for beholders. It gives you suggestions on how to roleplay beholders. It gives you charts of what minions might be found in a beholder lair. And it does the same thing for all the above-mentioned monster types. Best of all, the book gives you battle tactics for the various creatures. This is extremely helpful for new DMs or even experienced DMs who want to more effectively challenge players. Speaking personally, I like to think I could play any monster with decent effectiveness, but this book lays out exactly how devastating some of these creatures can be if used to their full potential. You better believe the next time I drop a beholder or host of goblins on the table, I’ll have Volo’s Guide to Monsters open in front of me. What I especially like about this section is how it can easily lay the groundwork for creating a campaign surrounding a certain monster group. Say you want to have adventurers fight a gnoll warband that keeps tormented prisoners in cages or send them against a scourge of mind flayers serving a great elder brain. You’ll have all the information you could possibly wan to write that campaign. Most useful to players is the 17 pages in the center of the book. It details seven new races including aasimar, firbolgs, goliaths, kenku, lizardfolk, tabaxi and tritons. There are also quick entries for six monstrous races already detailed in full earlier in the book: bugbears, goblins, hobgoblins, kobolds, orcs and yuan-ti purebloods. That’s 13 new races players can use — even more than what’s detailed in the Player’s Handbook — so it’s time for some really interesting player characters. Anyone tired of rolling standard elves, half-orcs or humans is going to get a kick out of throwing down as a bugbear with its long-limbed ability (an extra five feet of reach) or rocking a full-blood orc and its aggressive ability (use a bonus action to move). DMs will also find this section pretty dang useful especially if they want to make their own monstrous NPCs, say an evil yuan-ti or a hobgoblin chieftain. Then we enter the bestiary. Together with two appendices, the bestiary section and a pair of appendices feature more than 120 new monsters, creatures and NPCs. As wonderful and diverse as they are, I personally may not find use for a ton of these monsters. But that’s fine. Each new monster book is supposed to introduce new stuff, and I do think I’ll have to find a way to introduce a froghemoth (a huge frog monster), some grung (tropical frog people) or a slithering tracker (a sentient liquid revenge monster) into my games. It’s also nice to see monsters such as guard drakes, shadow mastiffs and maw demons. They’re all monsters for which I have miniatures, but until now, I didn’t have stats to actually use them. And considering the expanded information on the monsters that make up the meat of Volo’s Guide, it’s great to see more types of orcs, hobgoblins, gnolls, beholders and mind flayers, among others. The stats for a elder brain, gnoll witherling or a mind flayer lich (holy crap, what an idea for a villain) are also great things to have if you’re shaping up one of those campaigns. It all adds up to an incredible book that’s frankly packed with so many little details and bits of information. I understand why the fine folks at D&D wouldn’t want to make this a Monster Manual: this is way more than a Monster Manual. What they did is combine a bestiary book with about 10 splatbooks. They could have eked these things out one at a time for two years, and they could have charged us $25 for the pleasure of buying the things. No joke: Each detailed monster chapter could have been its own thing, but DMs who pick up Volo’s Guide are going to find enough inspiration here to run games for years to come.